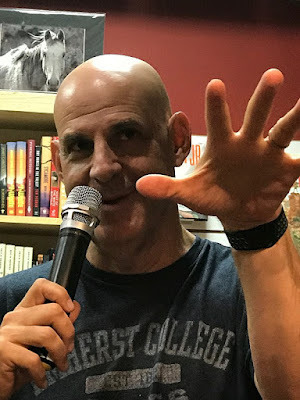 Harlan Coben at The Poisoned Pen! How do you know when an extremely popular author is appearing at The Poisoned Pen? When you show up over two hours early to discover that the parking lot is almost full and all the best seats are already reserved. This is what happened to Denis and me when we went to see Harlan Coben. This meant a different strategy: I sat back in the back where I had room to wield my pen and notebook, and Denis reserved the remaining seat in the front row so he could hear and take photos. 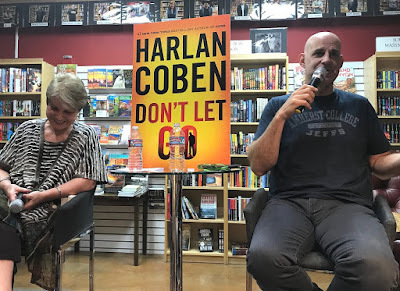 L to R: Barbara Peters & Harlan Coben having fun. When asked, Coben said that his first book published in 1990 when "I was one." Barbara shook her head in mock despair and said, "You were one and I was still fifty. Rats!" 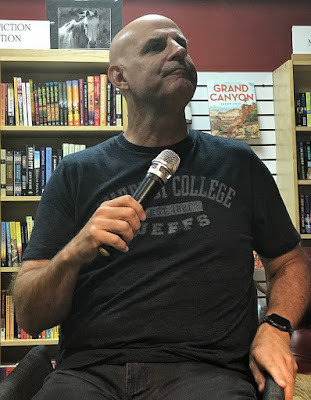 A fan asked if that first book was Play Dead, Coben said yes and mentioned that his first two, the aforementioned Play Dead and Miracle Cure were published by a small press. He hates both books and wouldn't let them be published again for twenty years until the French were granted permission. 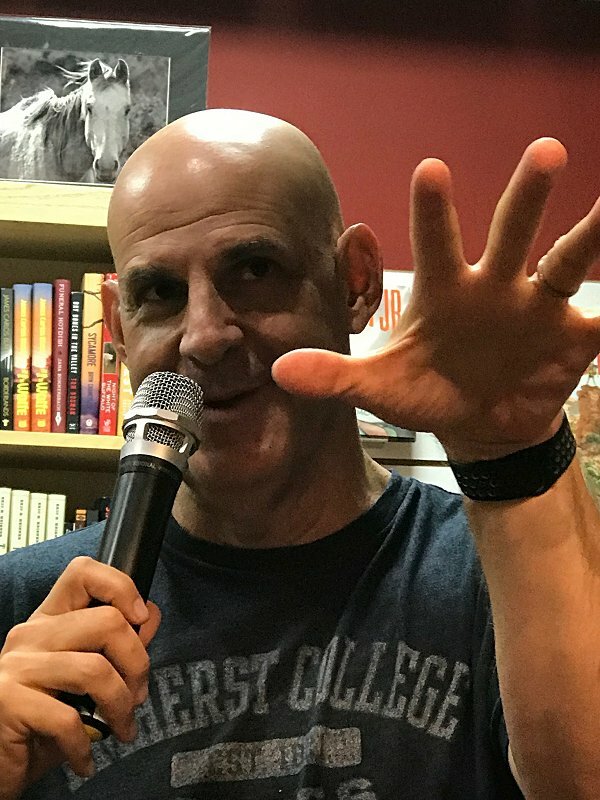 The French have really taken Harlan Coben to their hearts, and after he finishes his book tour here in the U.S., he'll be going to France. 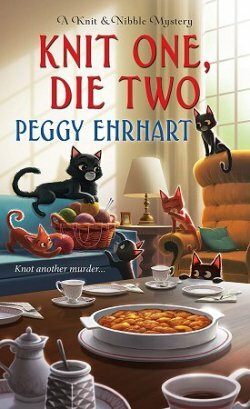 "I am the Jerry Lewis of crime fiction over there. I'll have you know I have a really hard gig coming up," he said. "I'm going to Paris, and then I'll be the Guest of Honor at a book festival in Bordeaux. A local winery called me and asked if I would like to stay in their chateau while I'm there...."
The main character in Coben's new book, Don't Let Go, is Napoleon "Nap" Dumas, an American of French lineage. When asked if that French lineage was intentional, Coben said yes. "I wanted him to have a little bit of the French attitude because I find their attitude toward things to be interesting. Nap is a darker character than most; he may be back, I don't know, but he is darker. The book is written in the first person present tense-- I think this is the first time I've done this-- and he is telling the story to his dead twin brother. "I try not to pay any attention to Amazon reviews. I'm proud of all the books I've written--except for those first two!-- and I'm just too long into my career to get involved in all that. I can't predict how well any of my books are going to do. 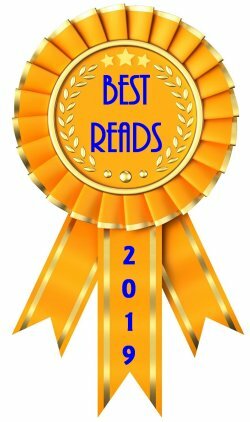 I'll think I'm due for a bomb and then I'll read something someone's said calling my latest the best book they've ever written, and I'll say, 'Yeah, I knew it all along.' I can't be objective anymore because I am very influenced by what you guys say." There ensued Coben's impression of his teenage daughter seeing her dad in the New York Times and his reading of some texts between his daughter and wife about which he swore us all to secrecy. If I added [laughter] every time we all laughed, I wouldn't get anything else typed up for you. We were all eating out of the palm of Harlan Coben's hand. This man is a master. 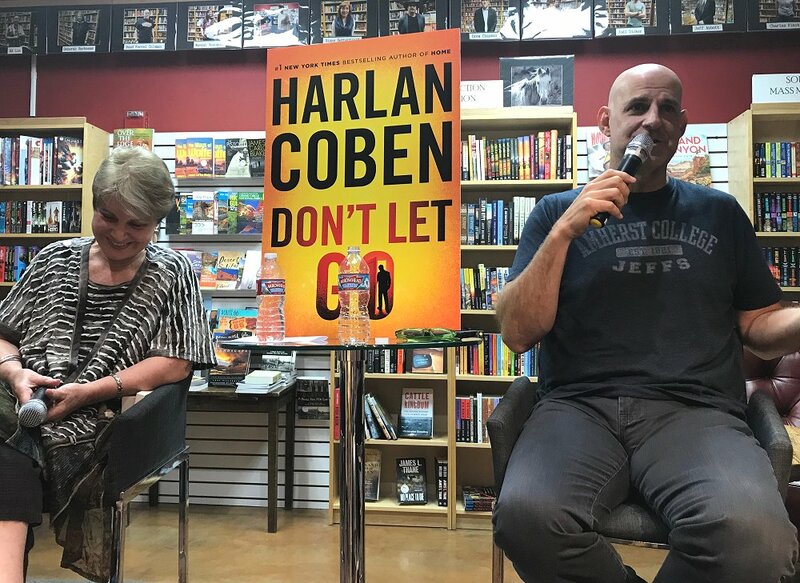 After reading us a few paragraphs from Don't Let Go, Coben told us that he'd "been on CBS This Morning, and I still have makeup on because I look so good in it. They asked me if I wanted makeup, and I said, 'Oh yeah, slather that sh*t on, man, that's good! And I'll tweet about it sometimes and then get these emergency texts from my kids." 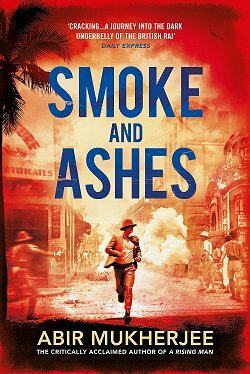 Nap happens to be a cop, and Coben has written about a cop only one other time. "Part of the reason why I don't write much about cops is that I'm a lazy researcher. I'm not Michael Connelly with all his resources. "Research is the greatest excuse not to write for two reasons. One, have you ever read a book that slows down because the author learned a lot of cool factoids and had to put them all in the book? That's not a problem with me; I don't know anything! Two, research is more fun than writing. Check Google Earth to get your bearings, write the scene, then go there if you have to add the ambiance." Barbara advised us all not to go home thinking that we were just going to read a chapter or two. "Once you get started, you'll want to stay with it, so don't...."
"I'd advise just the opposite," Harlan interrupted. "I love it when you go to bed at ten thinking you're just going to read one chapter and at 4 AM you're cursing me because you're still reading. That kinda turns me on." Coben is now involved in film. 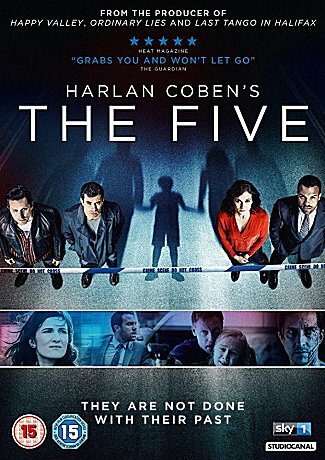 He's been working with people in the UK-- people who are responsible for programs like Happy Valley, among others-- and one of his original stories, The Five, is now available on Netflix. "These are original stories, not adaptations," Coben told us. "You will know everything by the end of the ten episodes. I told them that I wasn't going to sell season two by having a cliffhanger at the end of season one. There are no cliffhangers. I'm working on another Netflix Original called Safe, and we're about halfway through filming." "Why did you decide to write for a visual platform?" Barbara asked. "It was kinda 'Why not?'" Coben admitted. "Don't Let Go is my thirtieth book. That's a lot of time alone in a room. It was fun to get out and collaborate with a bunch of very creative people. I also am willing to listen to their advice. In No Second Chance [another Netflix Original, this time for France], I changed a male character to a female character because it worked better." When asked about his writing rituals, Coben said, "My ritual is to use whatever works until it no longer works then look for something else. In other words, I'm riding a horse, the horse dies, then I'm looking for another horse." In good news for many Coben fans, I did hear him say that he will be writing more Myron Bolitar fiction. "Myron didn't start out being a high expectation series," Harlan said. 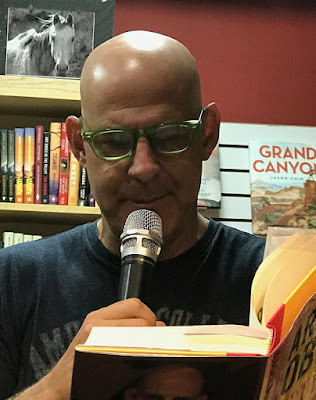 "In fact, I know of many cases where someone would pick up one of the Myron books saying 'I want to read this guy's books' then read the back and end with 'Oh... he's a sports writer....'"
"The one natural talent every writer has to have is empathy. You have to be able to get inside each character's head and see the world from their point of view," Coben said in answer to another question. 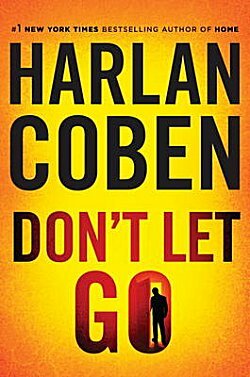 When Barbara mentioned that Don't Let Go will be #1 on the New York Times bestseller list next week, Coben shook his head. "I'll be #2. 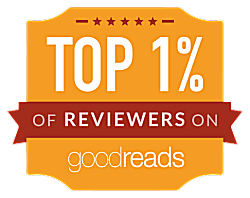 Stephen King's book came out the same day as mine, so he'll be #1-- and I'm pissed!" he said with a devilish twinkle in his eye. "Although he did call me to ask permission to use me as a character in his next book!" One fan asked him where he got his ideas for his books. "You never know where they're going to come from," he replied. "Promise Me came from my overhearing two teenagers talking about drinking and driving." When one film company talked with Coben about casting a Myron Bolitar movie [which never came about], they asked the author about George Clooney playing Myron. "George Clooney? NO! They came back with Adam Sandler who was popular at the time. Adam Sandler? WHAT?!? I was having heart palpitations. But then I realized that I had to be like Lee Child. 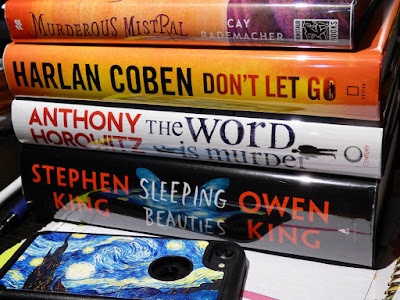 Whatever happens, the books are still fine." Lucky you, Cathy! It sounds as though you had a great time, and I'm not surprised. Coben is a really talented author, so I'm glad you got to see him. I don't know why I kept putting off seeing him. I ought to know by now that there's a very good reason for an author to show up at The Pen year after year! Glad to hear there'll be more Myron books. I've enjoyed most of his books. Not great literature, but a darn good read. And many times that's all that matters. What a wonderful event. Thanks for sharing it with us. 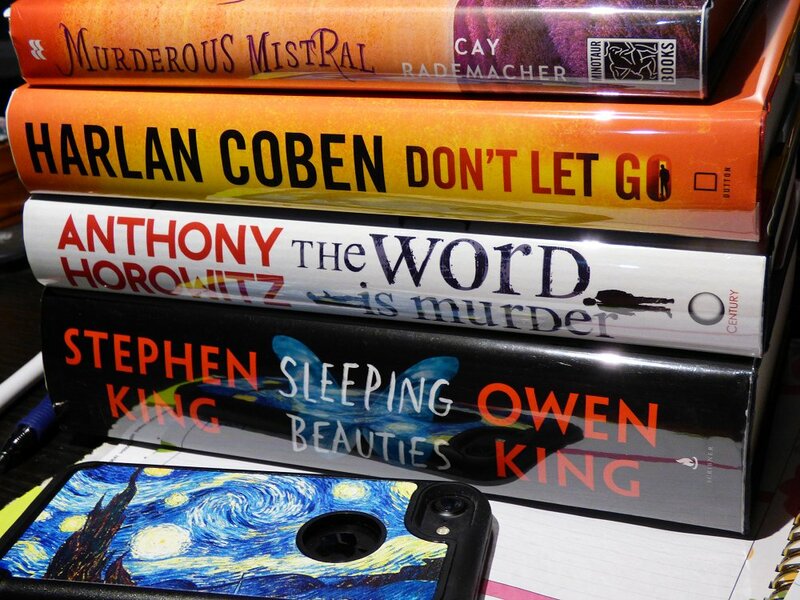 Mr. Coben is one of my favorite authors that I discovered by accident. While I had readers and authors asking me why on earth I hadn't read any of his books yet!